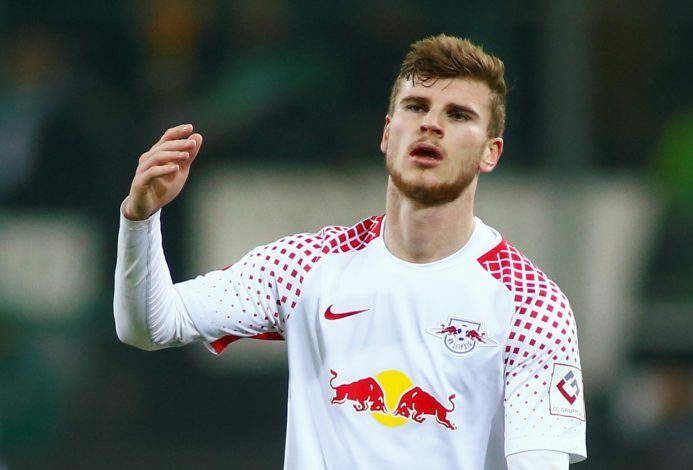 RB Leipzig striker Timo Werner has reportedly revealed his desire to play in the Premier League, with Manchester United being his dream destination. The German forward is one of the hottest properties in Europe at present, and has been linked with a host of clubs, including the likes of Real Madrid, Barcelona, Arsenal, Liverpool, and Manchester United. But the 22-year-old has his eyes set on a move to England’s top flight, and speaking exclusively in the April 2018 issue of FourFourTwo, the former Stuttgart man revealed that he was inspired by watching Manchester United and Liverpool as a young footballer. Werner stated: “Yes, playing in the Premier League is a dream for me. I would like to play for two or three clubs, and Manchester United are one of those clubs. But probably not in the next few years – later, when my English is a little bit better! I’m very comfortable at RB Leipzig, though. The Leipzig striker further claimed that though he supported both the Premier League giants, he was more ‘Manchester United than Liverpool’. The Germany international has been phenomenal since he completed his switch to Die Bullen back in 2016, and has netted 37 goals in 65 appearances for the Bundesliga side so far.